I sure am guilty of these! If you’re in a relationship with an Aries, and then they seem like they’re slowly starting to shut you out of their lives, then that means they’re not very happy about the direction of your relationship. Anyone who has ever been in a relationship with an Aries will know that they are always prone to oversharing. They like to open themselves up to their partners all the time about their feelings, thoughts, and moods. However, when they grow unhappy with their partners, they will start to build walls to conceal their innermost thoughts. Whenever a Taurus is feeling particularly unhappy in a relationship, they will tend to overcompensate by broadcasting the opposite of what they’re feeling. They will exaggerate the happiness in their lives by showing off on social media and in real life. They will put on a big smile, tell the most interesting stories, and post the grandest of pictures in an effort to conceal their true unhappiness. A Gemini’s life will practically fall apart unnecessarily because of unhappiness in a relationship. While the relationship might seem like it’s going smoothly and without much trouble, a Gemini’s life outside the relationship is struggling to keep afloat. These Gemini will deflect any problems in their relationship towards work, their hobbies, friends, family, and more. It may be because of the fact that they get heavily invested in their relationships and couldn’t fathom the thought of being in a dysfunctional one. When a Cancer becomes very unhappy in a relationship, you can expect their maturity levels to drop like flies. They will start to become the pettiest, most immature, and childish people you will have the unfortunate opportunity of meeting. They will start taking passive-aggressive approaches to trying to appease the situation. They will drop petty comments here and there for the sole purpose of making you feel bad. They will also refuse to talk the situation out and deal with it in an adult manner. When Leos become unhappy with relationships, you can always expect them to espouse a level of fierceness and brutality that you may have never experienced before. They will start to lash out and become very combative and aggressive. Their confrontational tendencies will start to become more prominent and you will forced to bear all the aggression. You will know a Virgo is unhappy whenever they start being hyperactive and engage in other hobbies or points of interest. They don’t like to deal with their personal problems directly, and so they will try to find distractions that they can divert their attention to. They will keep themselves busy by being caught up in more innocent and less volatile matters than relationships. If you notice that your Virgo partner has been taking up a lot of random hobbies lately, then that may be a cause for concern. Libras will immerse themselves in their work and their careers whenever they feel like their relationships are in trouble. They feel like relationships are uncontrollable and they are too sporadic in nature. With their work lives, Libras can once again feel that sense of control and predictability. While this may be good for their careers, it might not be doing anything to improve the situation of their relationships. Scorpios are known to be some of the most intense kind of people you will ever have the privilege of meeting. Whenever they start being unhappy in a relationship, they will freak out over everything, and you as a partner will be forced to bear the weight of all that craziness. They will get overly emotional, and you might want to just let go of your relationship for the sake of the Scorpio’s mental sanity. When Sagittarius people get upset, they have no problems wearing their emotions on their sleeve. They will become very irritable and they will get very passive aggressive. They have the tendency to get very irate over even the simplest of matters. 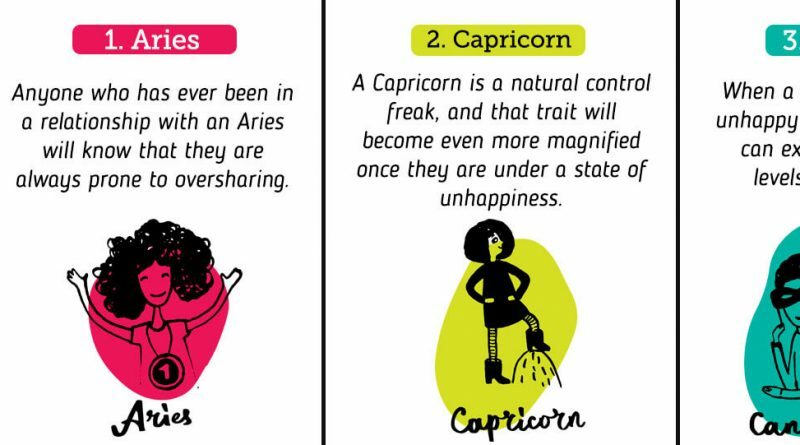 A Capricorn is a natural control freak, and that trait will become even more magnified once they are under a state of unhappiness. They will try to manipulate the variables in the best way that they can to help improve the situation. They will allow their inner control freak to come out and play without censorship or suppression. When an Aquarius becomes unhappy, they will become some of the most selfish people you will ever meet. Once they are experiencing discontent, they will start to focus only on themselves, and slowly, they will just let the relationship die. They won’t even care about offering any of their time to their partners anymore. A Pisces gets very uncomfortable fairly quickly as compared to others. That’s why whenever they experience unhappiness, the sheer discomfort of the feeling will leave them with the insatiable desire to pursue ultimate freedom.